This mollusk, the scallop, is of the class Bivalvia. 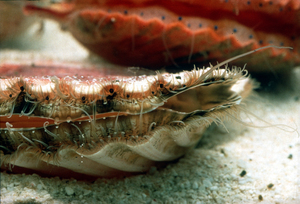 Bivalvia, as their name suggests, have two shell plates that are bilateral. Most bivalves are filter-feeders, with gills having both the function of food collection and gas exchange.